I have always had a gentle fascination for books. I love stories, reading them, hearing them, writing them. But the format of a book. the heavy shape, the dry texture, the musty smell of library books... The way that physical books make me feel is quite something else as to the mystery worlds they hold beneath the covers. Whilst working at the Tate I found this book, which the staff kindly gave to me as my leaving present. 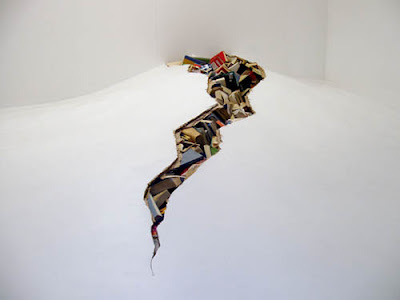 It is full of beautiful art crafted out of books. 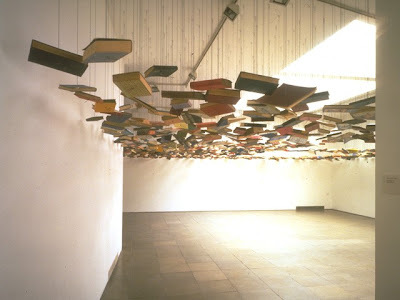 Gestalten's Book Art. I know this may seem strange, as my friend gt once told me, it is heresy to hurt a book. And as I do have a profound love for books, then I should not condone the tampering of such special objects. But In this book the pages transform into something else. Just as I love to see letters and words taking different shapes and telling different stories to their usual form, some of the works of art in here are completely stunning. They are not destroyed, but transformed.